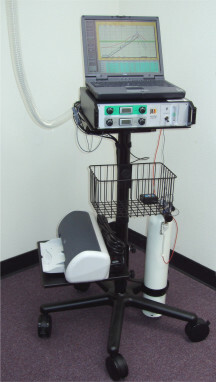 Vista-MX is a complete metabolic measurement system for Cardio-Pulmonary Exercise Stress (VO2 and VCO2) and Resting Energy Expenditure (REE) testing. It may be used as a portable desktop system with your own computer, or with your choice of integrated mobile carts, including "IBM-compatible" computer and Super-VGA high resolution monitor. The basic Vista-MX includes O2 and CO2 gas analyzers, permanently calibrated turbine ventilation meter, a USB interface with our "TurboFit" software and either a mouthpiece or face mask interface. All you need to add is a PC. Flow Sensor: Permanently calibrated turbine. Accuracy: +/- 2%. Optional low-flow sensor for pediatric measurements. Size/Weight: 35.5 cm W, 9.5 cm H, 35 cm D, 10 pounds.